John Witherspoon born the eldest child of Reverend James Witherspoon, and Anne Walker, who may have been descended from famous Calvinist preacher John Knox. He attended the University of St. Andrews, and following in the footsteps of his father, received a Bachelors in Divinity. He then earned his Master of Arts degree at the University of Edinburgh at the age of 19. He soon moved on to become a pastor in the town of Paisley in 1757. His intellectual endeavors such as his book Ecclesiastical Characteristics earned him recognition by many highly regarded people of the time, including the Americans Richard Stockton and Benjamin Rush. Witherspoon was offered a job as the president of the College of New Jersey (later named Princeton University) by Rush, who eventually convinced him to take the job and move to America in 1768. As a president of the College of New Jersey, he expanded the school’s curriculum, sponsored scientific innovation, and increased both the school’s endowment and enrollment. Witherspoon initially kept his political beliefs to himself as the president of the university; however his Scottish Enlightenment roots resonated with the political winds of the time. He became an advocate for American independence and was elected to Continental Congress in 1776, and then again in 1780. He was also signed the Declaration of Independence, the only member of the clergy to do so. Witherspoon taught many influential people such as James Madison and Aaron Burr as well as 39 congressmen, 21 senators, 12 governors, nine Cabinet members and three Supreme Court justices. After the war, he rebuilt many parts of the University that had been destroyed by the British invasion of 1776. 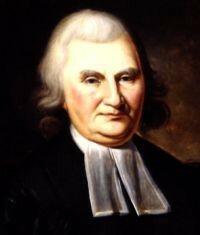 John Witherspoon was a prominent member of the Continental Congress for eight years and signed the Declaration of Independence and other important documents. As previously mentioned, he educated a great number of future American leaders, and his strong support for democracy and republicanism was transmitted to his students. After his death, the Witherspoon Institute was founded, which promotes public understanding of free and democratic societies and republican governments. John Witherspoon had a large impact on both Princeton and all of America. He was president of Princeton, one of the most prestigious universities in the entire country. He died on his farm, Tusculum (Today located next to Mountain Lakes park), just outside of Princeton and was buried in the Princeton Cemetery.